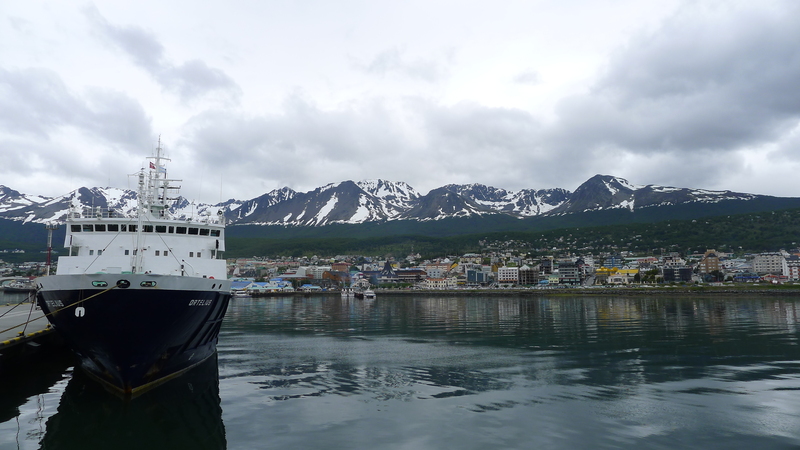 If you have never been to Ushuaia, then learning that it lies in the Tierra del Fuego might conjure up images of a hot, tropical paradise. But, while Buenos Aires has the sweaty, sticky, Latin heat, the “Land of Fire” at Argentina’s southern tip has a rough, cold, and slightly unwelcoming facade. Standing on the edge of the Beagle Channel, basking in the never ending sunlight that makes the late Spring 50 degree weather feel so inviting, the town glistens with color and warmth. But the cold breeze and snow covered rocky mountains that surround the town have me wondering how people could have eked a living out of this harsh ground before the cruise ships moved in. People have lived in this area for thousands of years. The name “Tierra del Fuego” comes from Spaniards first trip to the area in 1520, during which they were greeted by fires in the mountains. Magellan believed these were lit by the indigenous Yaghan Indians waiting in the hills to ambush his crew. Today those fires are replaced with the flashing bulbs that line the Casino’s front door. Corrugated metal buildings that lined the streets when I was here just 5 years ago, are now side by side with a 5 star hotel and several huge outerwear stores that could make some R.E.I. establishments look under stocked. It is a strange place, this land of fire at the end of the world. It is a place so warm and inviting but so cold and foreboding, so removed from everything and yet lit up right in the middle of the wave of people reaching out towards the last new world.